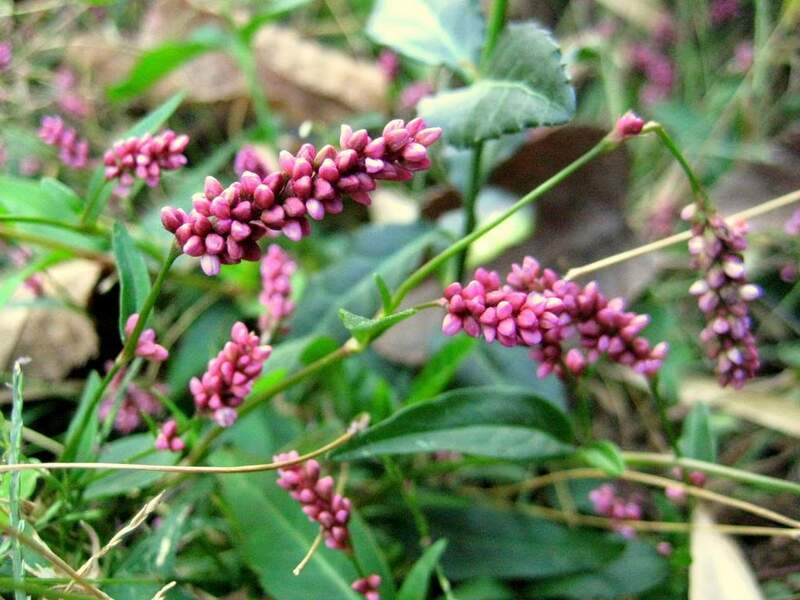 Of the many different types of ubiquitous weeds in my lawn and garden beds, during late summer and fall one of them is "king of the weeds" by far: smartweed. Although this weed grows and blooms all summer long, it seems like this time of year is when I really notice it. Maybe it's just this year that it's a problem though. 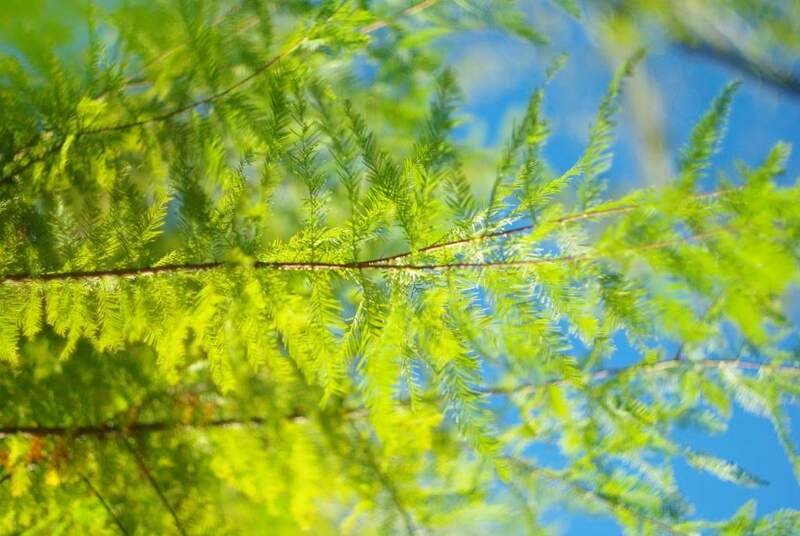 Bald Cypress. I love this tree! Three weeks ago I took some photos of my bald cypress tree, thinking I'd do a post about it. Although I've been sneaking photos of it into other posts once in a while, it's such a beautiful tree I wanted to collect enough photos to give it an entire post of its own. 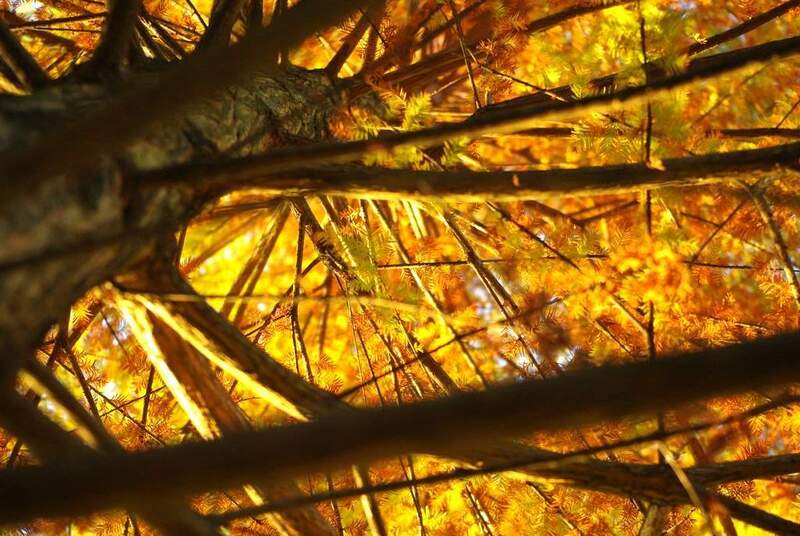 For a deciduous tree at this time of year, a lot can change in three weeks. The tree completely changed its color palette in that time, which makes this post so much better I think. Green is nice, but add in some other colors and you really have something to look at. 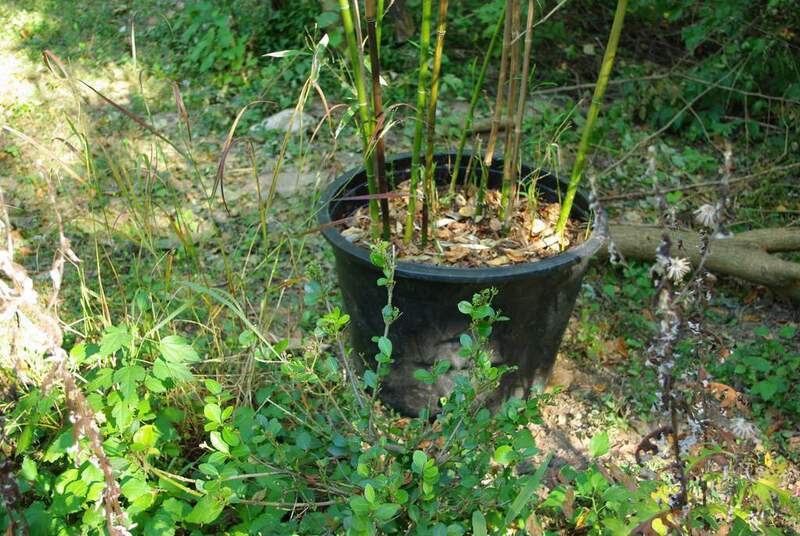 Yesterday I wrote about planting the first of my two new clumping bamboos. Today I tackle the second one, the Fargesia murielae. This one is going to be a snap compared to the first one, as there are no weeds to clear or stumps to remove. Recently I posted about Fall being a great time to find bargains at the local nurseries -- in that case, new pots. 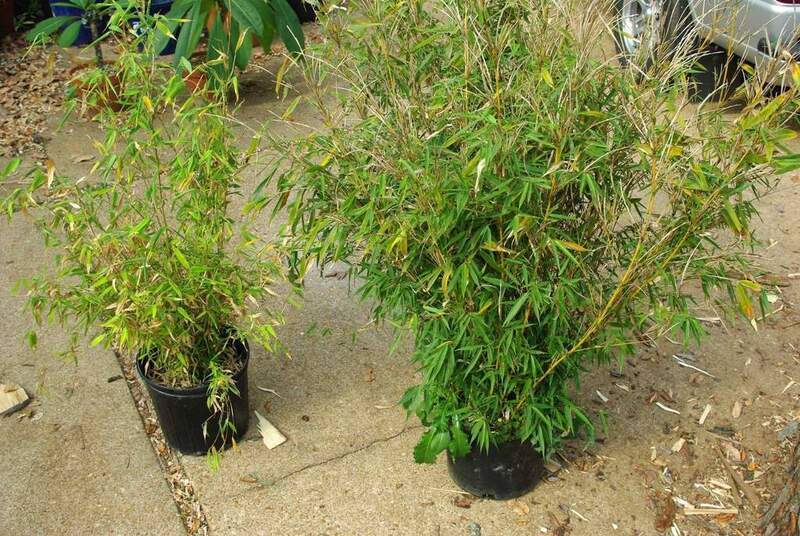 Today I will talk about some more great bargains I found last weekend: more bamboo plants! If you read my blog regularly, I know what you're thinking. 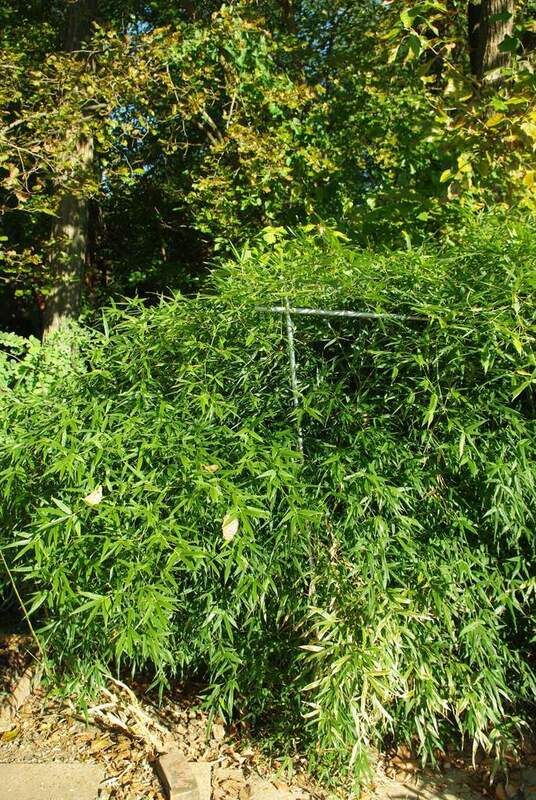 You're thinking I already have more bamboo in my garden than most normal gardeners. You're thinking "where is he going to find somewhere to plant these -- bamboos need a lot of space, don't they?" 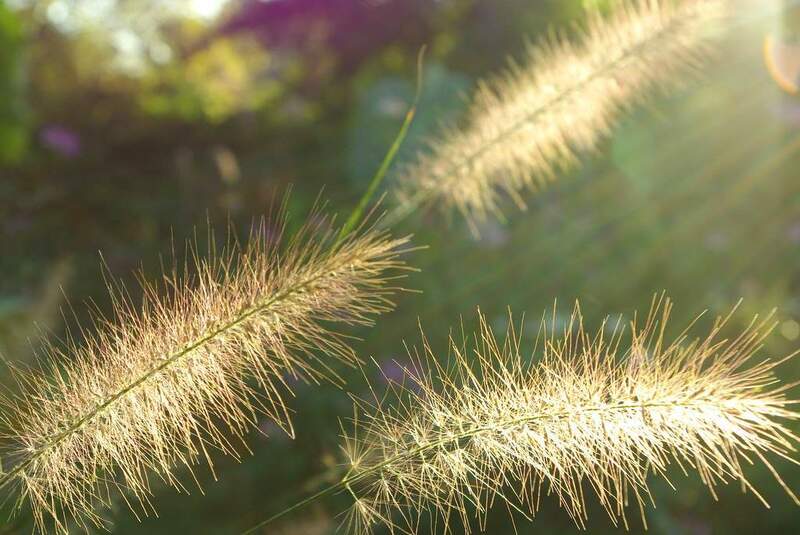 One of the great things about ornamental grasses is the "winter interest" that they provide to the garden. They sway in the wintry winds, look great in the snow, and even provide shelter for birds and other wildlife. For those reasons I do not cut my grasses down until late winter, with one exception. This one will be gone much before then. Actually, it's already gone. Those of you who grow plants either outdoors in your gardens or indoors as houseplants probably have had experience at one time or another with some sort of insect pest infestation: aphids, whiteflies, fungus gnats, thrips, scale, spider mites, bamboo mites (ack! 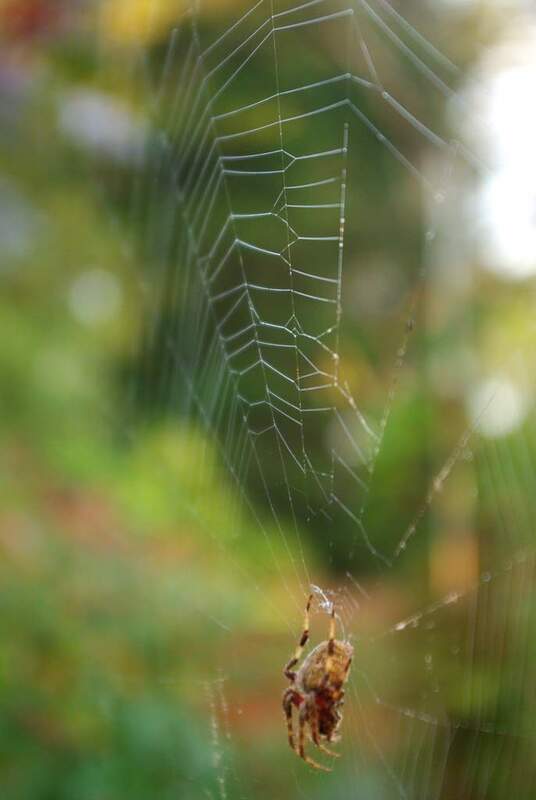 ), mealybugs -- there is a long list of "bad" insects that plague gardeners. 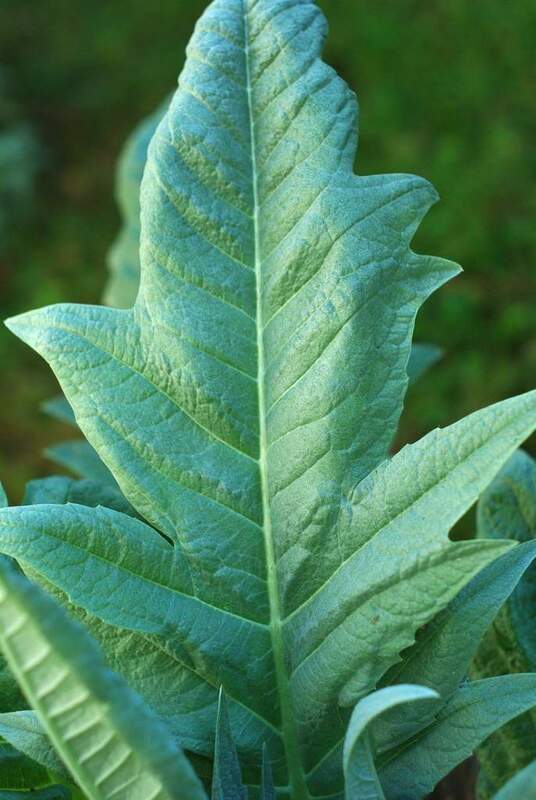 Although they like different conditions, and often specific types of plants, many of these pests are tiny sap-sucking bugs that can cover a large percentage of a plant. 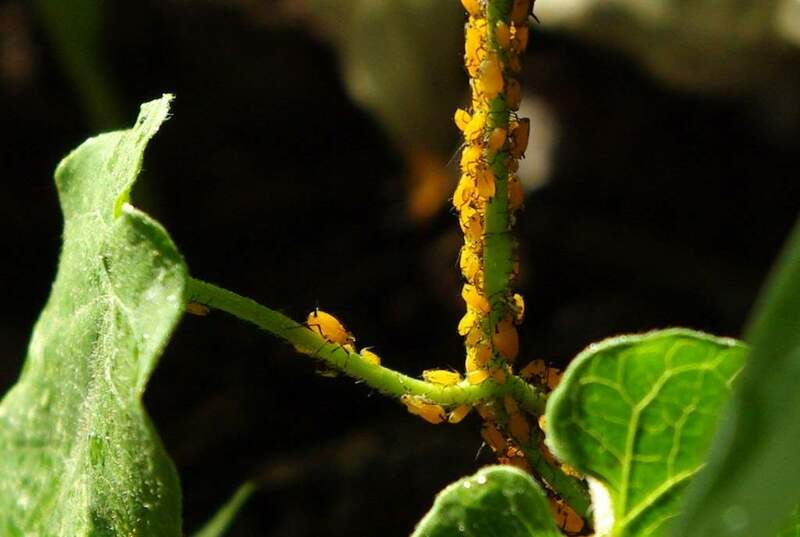 These aphids are an example -- when just a few of these small critters are attacking one of your plants they're hard to notice. They multiply quickly though, and seemingly overnight your plant is covered in an army of invaders intent on sucking it dry. 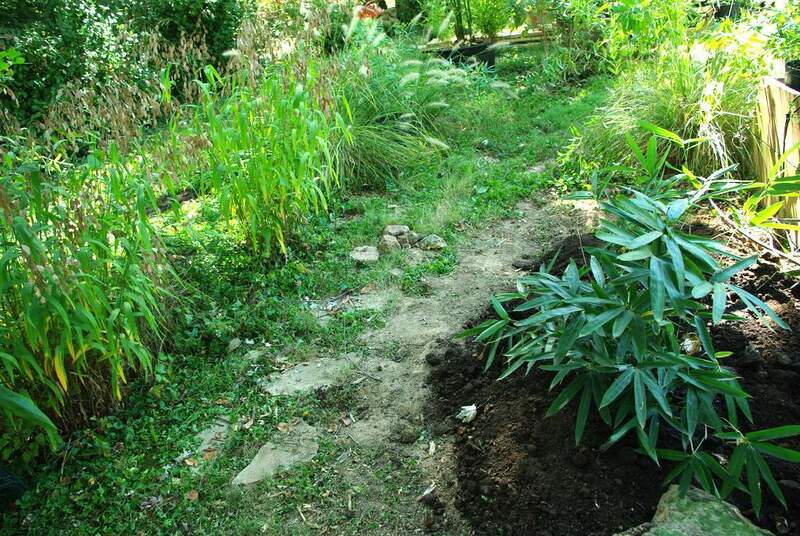 I'm going to be mulching most of my in-ground bamboos and some of the other planting beds in a month or so, to provide them with extra winter protection. The wood chip mulch also helps to condition the soil, adding organic matter as it slowly decomposes. I always mulch my planting beds. Except this year, when I didn't add any new mulch. The old mulch was there, but I never got around to adding the fresh stuff. 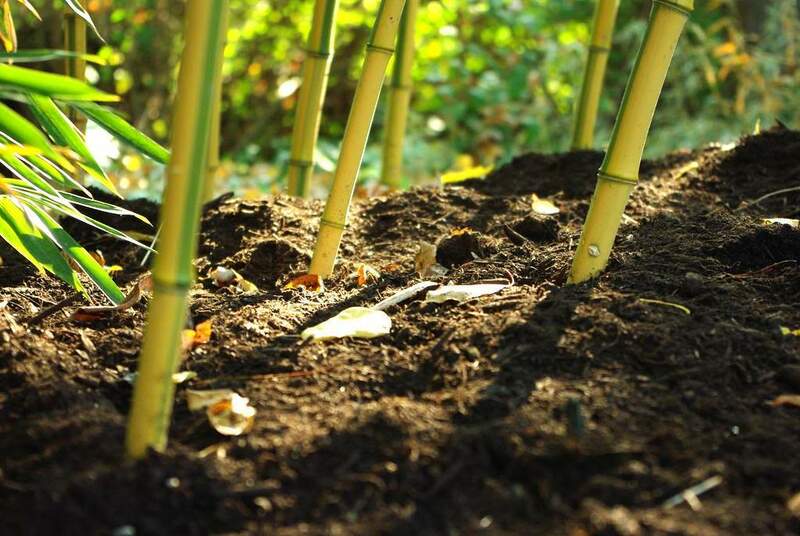 For my bamboos, the first step in mulching is to add an inch or two of compost. 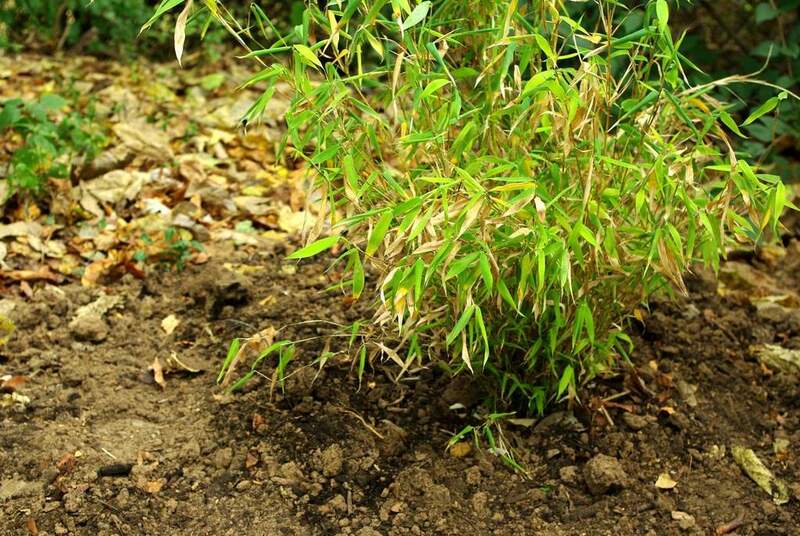 This isn't really necessary, but I like to baby my bamboos, and compost is always welcome in my garden. It's one of those mornings when the garden just hits me right. I'm not seeing the weeds in the lawn (or should I say "lawn of weeds"), nor the overgrown tangle of vines. I'm not seeing the dozens of potted bamboos that still need an overwintering strategy, nor am I seeing beds that need more mulching. In fact, I'm not seeing work of any kind. Maybe it's the time of the morning (a little later than usual), or the fact that the air is warm -- almost "hot" for this time of year. Whatever the reason, all I'm seeing this morning in the garden is color. Lots of color and texture. There's something wonderful almost everywhere I look. I've posted about my annual vines before. I think I've even mentioned in those posts how by the end of the season I'll have more vines than I can handle. If I didn't say it, I should have. It happens every year. The interesting thing about annual vines is they start out slow, reach a certain size, then the next thing you know they're gigantic! Unfortunately, this growth spurt happens in mid-to-late summer when I'm not watching all of the plants as closely as I was earlier in the year. So the vines get a little out of hand. Do you remember a few months back when I built a small raised bed using a large bottomless pot? I planted a Cardoon in it. I was hoping the plant would reach the huge proportions it did for me when I first started growing it a few years ago, and would add a bold element to this area of the yard. It hasn't quite matched my expectations, but I'm still pretty happy with it. 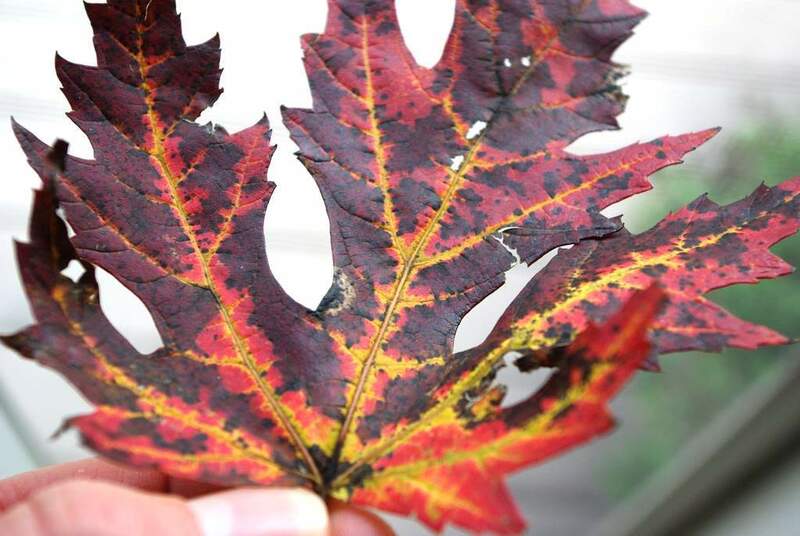 With the end of the growing season fast approaching, and cold weather sneaking its way into the garden every night, there are a few plants that are surprising me right now. 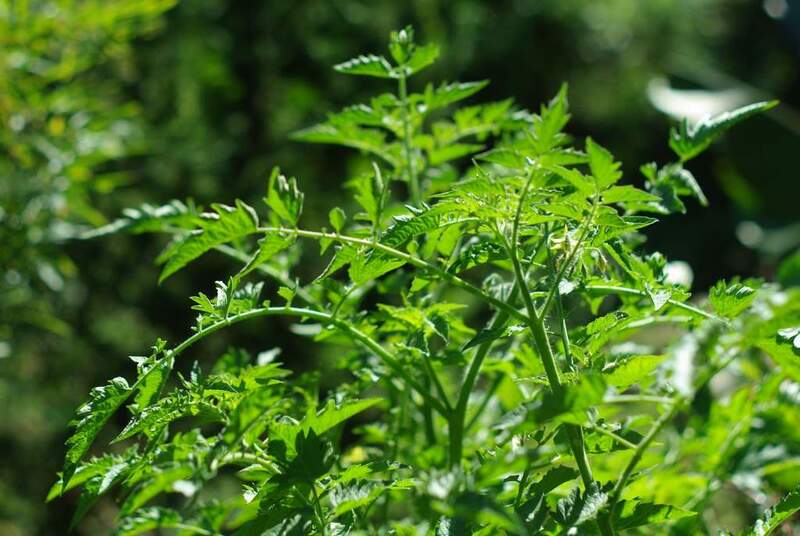 Yesterday I showed the thriving volunteer tomato plant with it's many small tomato flowers as one example. Today, it's fewer flowers, but more impressive ones. Specifically, white flowers. 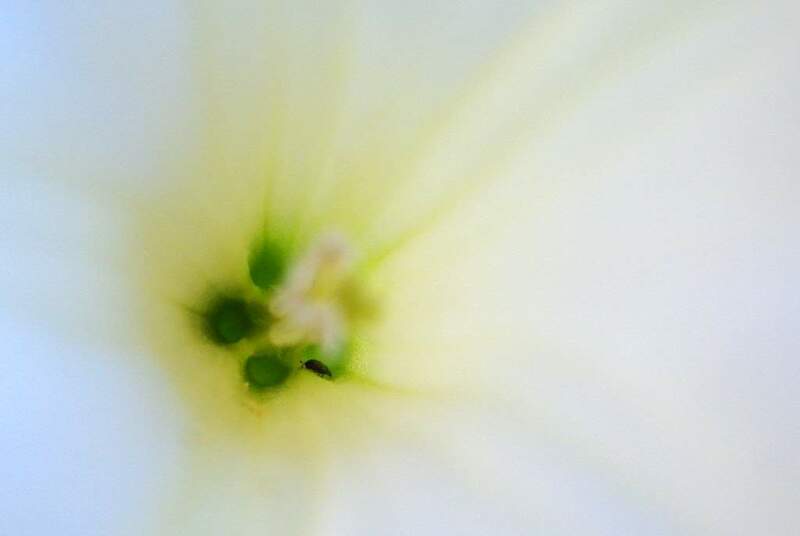 Even more specifically, the single white flower from this Datura inoxia. As much time as I spend in the garden, working, exploring, and photographing, I have to admit that there are some parts that I don't see as much as others. You might say I ignore them, even neglect them. Sometimes that results in weeds and a big mess. Sometimes it results in something that's a little better (or at least has the potential to be). 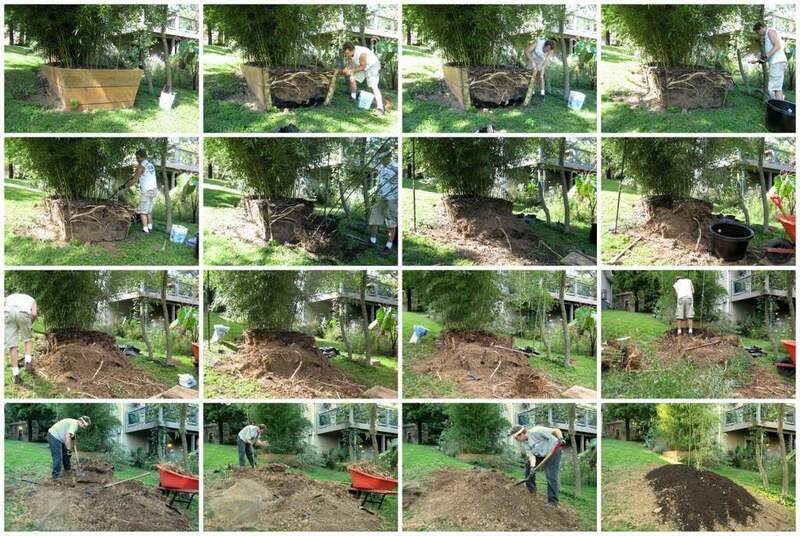 Today I'm going to stay in the general area where I planted bamboo recently (in two different posts) and redo a raised bed. Well, not so much redo, as "clear out". Mainly to get it ready for some new plants next year. This is one of three identical "boxes" that I built several years ago, and it's the only one of the three that has not been redone yet. (I replanted one of them earlier this year.) It's got several problems, the main two being soil compaction and weeds. 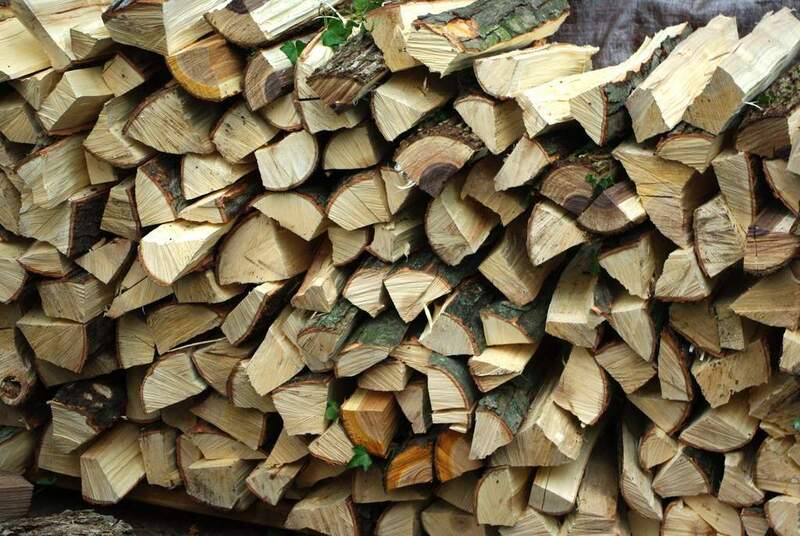 Recently I split a bunch of firewood, and needed to stack it. I always have trouble finding the right material for the bottom of the stack as I don't want to put the wood directly onto the ground (it will rot). I've tried using older logs for the bottom, but that always results in the fungi moving off those old logs onto my firewood. I've tried using bricks, but it's hard to use those on the uneven ground. Metal poles (electrical conduit) are too small. So I decided to use one of the boards from the raised bamboo bed I recently disassembled -- I'd keep it off the ground with some bricks. This wood has some obvious insect damage, but when I first saw it I thought it was due to ants. 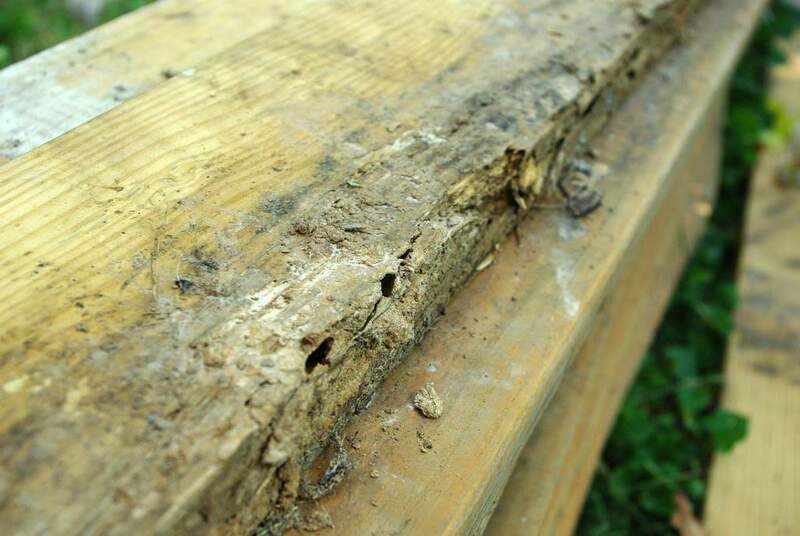 The boards have been stacked together since I pulled that box apart, and I found out that ants were probably not involved. It's the only maple leaf like this that I saw, so I knew I had to get some photos. 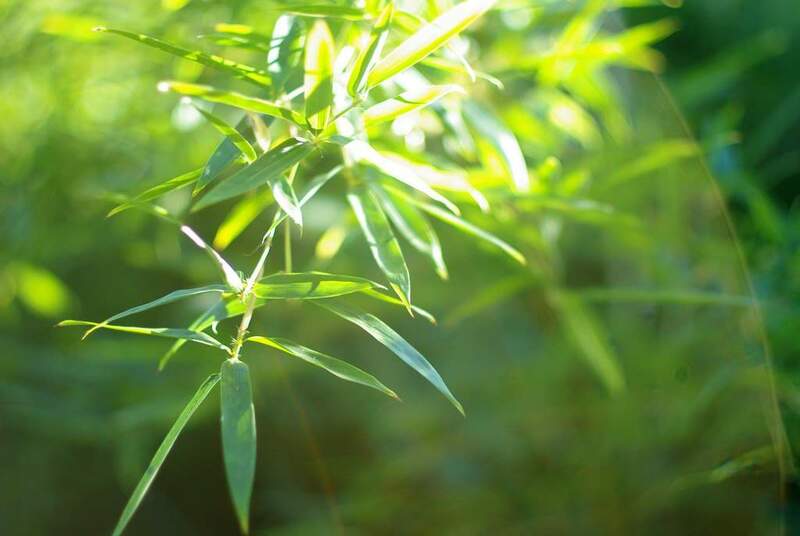 I've got several more bamboo-related projects to tell you about, but so you don't get sick of bamboo (as if that's even possible) I'll be interjecting some other topics. 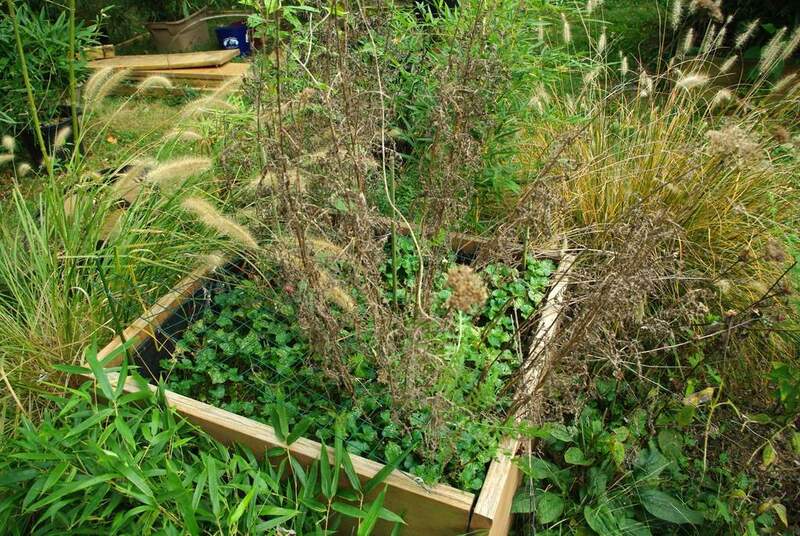 Successful gardeners are flexible and adaptable, ready to respond when an opportunity arises. Such an opportunity presented itself to me this weekend when I heard a nearby *crack* and thump -- the unmistakable sound of a large tree limb falling. It turns out that a neighbor a little ways up the street took down a large silver maple tree limb. I went up to watch them cut it up -- it's always fun to watch somebody else doing yardwork once in a while. When I asked them what they were planning on doing with the wood, they said "we're putting a 'free firewood' sign on it". It's Sasaella bitchuensis and is doing quite well here, even though it gets full sun until around noon or a little later (it's supposed to be a shade-loving bamboo). I'm not going to dig the whole plant up -- just remove some divisions from the two sides. I've been doing a lot of bamboo projects this weekend: planting, moving, trimming, more planting. Here's the first of these projects: I'll be planting this Phyllostachys rubromarginata division that I got about a month ago. 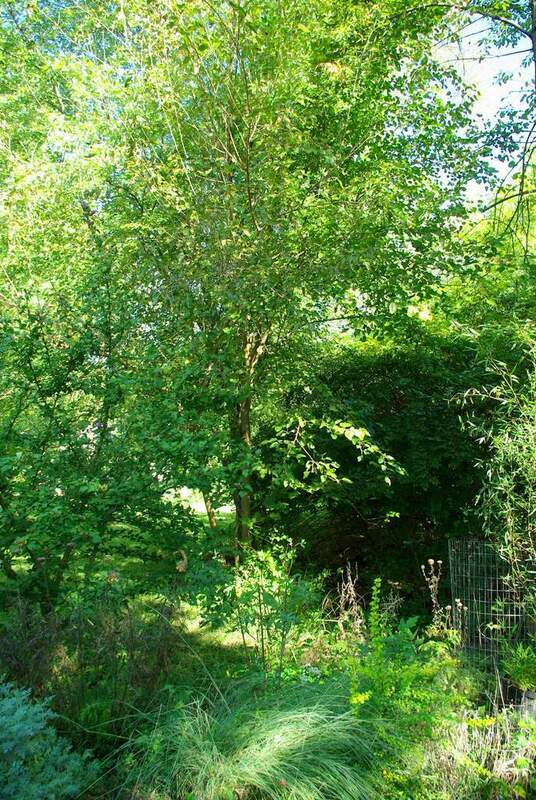 This is where I removed those mulberry trees last weekend, and even though I was unsure at the time, I have decided to put this one into the ground here. One thing I've learned about gardening is that you can never have too many containers to plant in. The container type that I plant in the most is ceramic or clay pots. 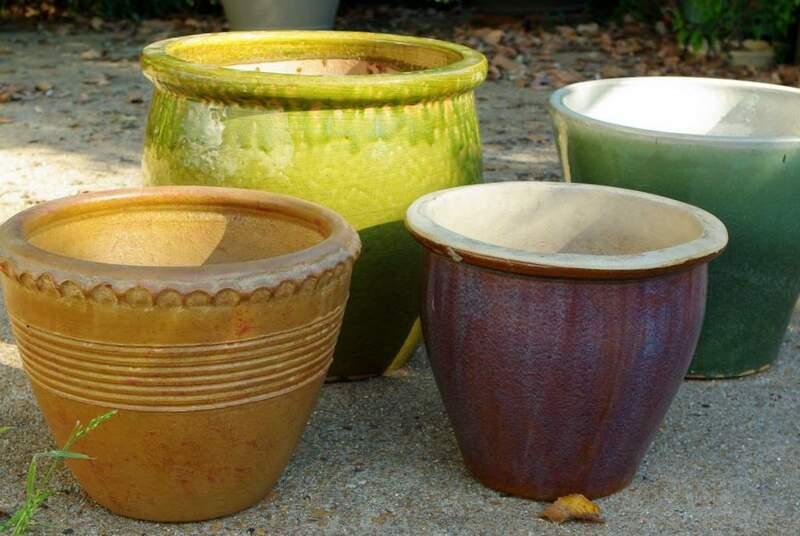 Glazed ceramic pots are almost a sub-obsession of my gardening obsession, and only their relatively high cost has saved me from having hundreds of them. If you live somewhere with cold winters, this is a great time of year to keep an eye out for sales and clearance items. I'll use this opportunity to stock up on supplies or find some bargain pots -- that's exactly what I did today. The days are getting shorter, and I keep forgetting about it. I spend most of the day in a basement room that has no view of outside (no windows that is), so without going upstairs it's hard to keep track of what's going on outside. For most of the summer I'd go outside around 6 PM (or later) and walk around the garden. It's a nice way to unwind after work, and a great time to start taking photos. This last week I've been getting out there about that time and it's almost too dark already -- at least darker than I'd like. I've been trying to remind myself to get out there earlier, while there was still plenty of light. Yesterday I finally remembered, and got a taste of the late afternoon sunshine. They're the seedpods of Castor bean, Ricinus communis 'Carmencita'. I typically remove these pods because they are quite heavy and tend to bend or break the branches. 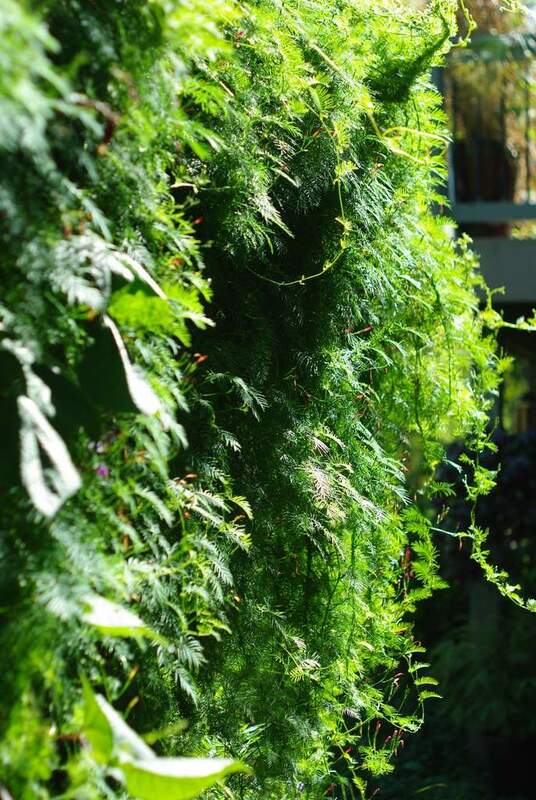 The plant is quite tall (about 9') so these are too high to reach easily now, so they remain. 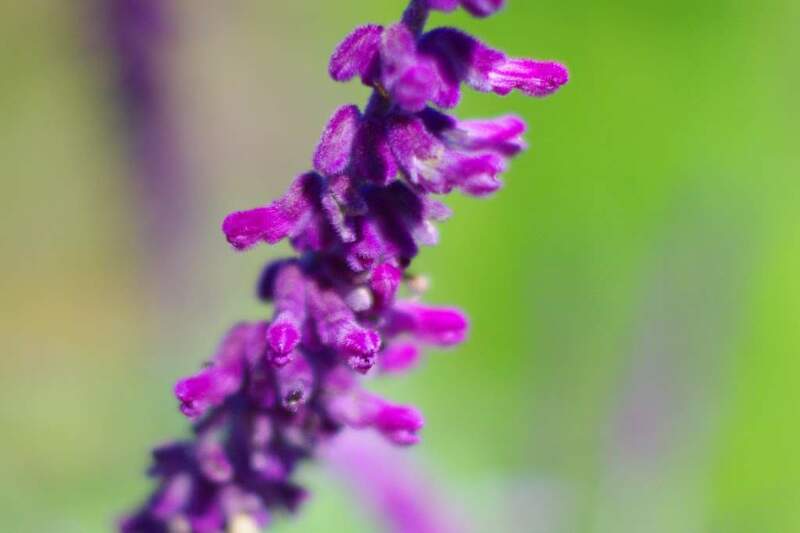 As you can tell by the title of this post, it's all about the fuzzy and the purple today, compliments of a single plant: Salvia leucantha, or "Mexican Bush Sage". This is one of the last plants to bloom in my garden, but it's definitely worth waiting for. If you're not a big fan of purple, or have some aversion to fuzziness, you might not want to continue reading this post. Yesterday I posted about trimming some mulberry trees. Today I will do some extreme trimming -- in fact, I'll remove most of three more mulberries. These are all growing very near the back corner of my yard, and I'm not sure if they're on my property. They're probably in my neighbor's yard, but since 1) he'll be moving soon 2) this is way in the back where he rarely ventures and 3) I know he doesn't care -- I'm just going to take them down. Our suburban St. Louis city provides a "chipping service" twice a year, when they drive a truck through the neighborhoods collecting any limbs that the residents have put out for pickup, and feeding them into the chipper. 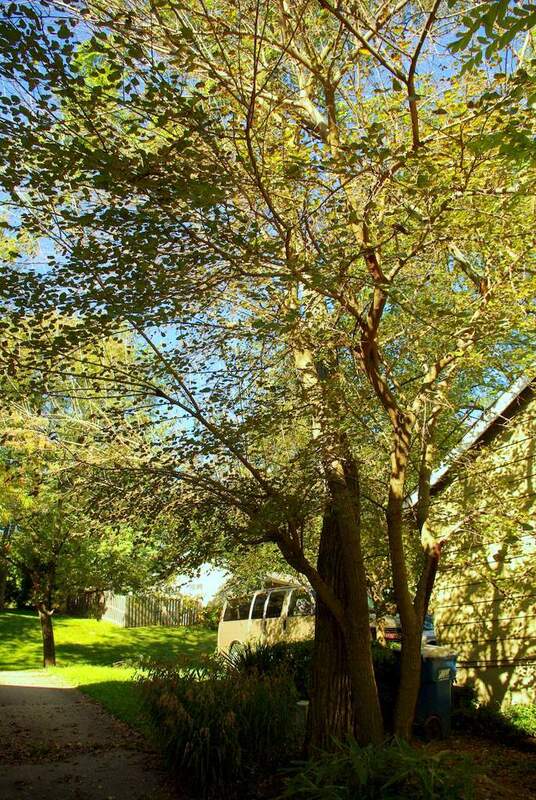 Because of this service I have one or two days each Spring and Fall where I trim trees, remove bush honeysuckle, or take down small unwanted trees. This past Sunday I did just that: trimmed some branches and removed a couple of smallish unwanted trees. 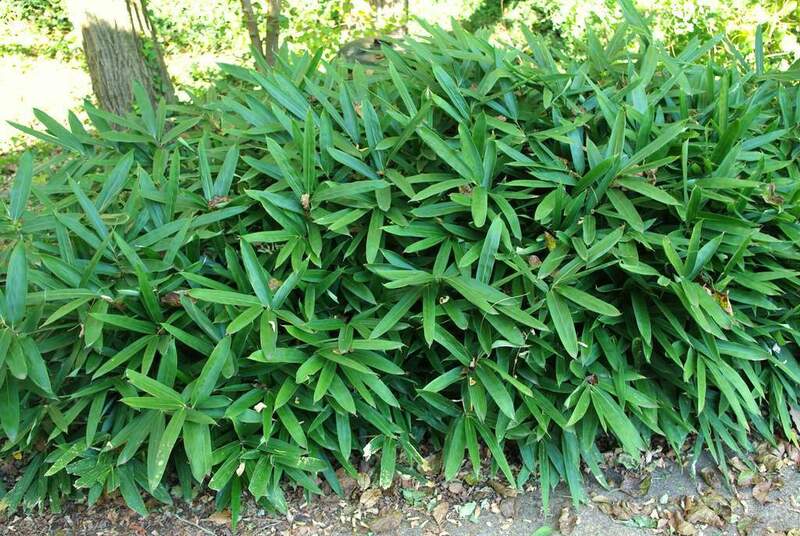 I did not remove any bush honeysuckle, even though there are a few left on the common ground behind my yard -- I'll get those in the Spring. This is the time of year when the ornamental grasses really become the stars of my garden. 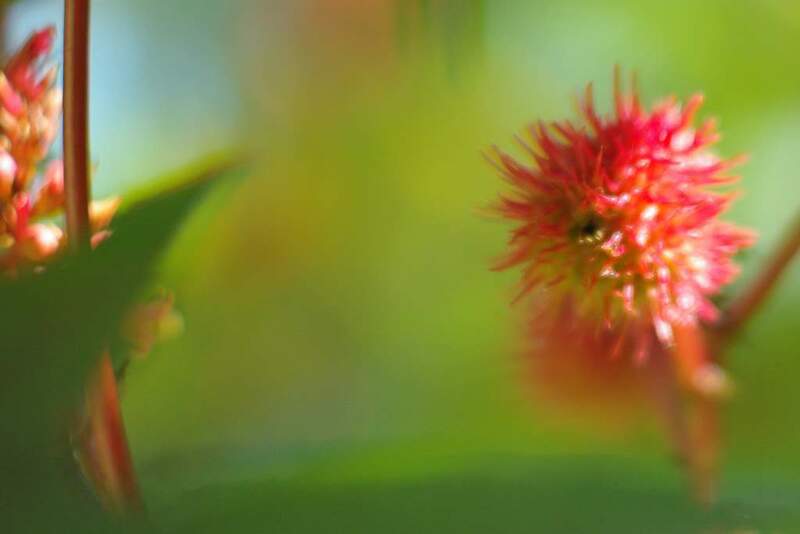 It's not that they've changed colors or done anything too dramatic, it's just that their seed heads (or "inflorescenses") have all emerged, and they add so much softness and interest. The way they catch the light in the morning is almost magical, and the slightest breeze starts them dancing and swaying. 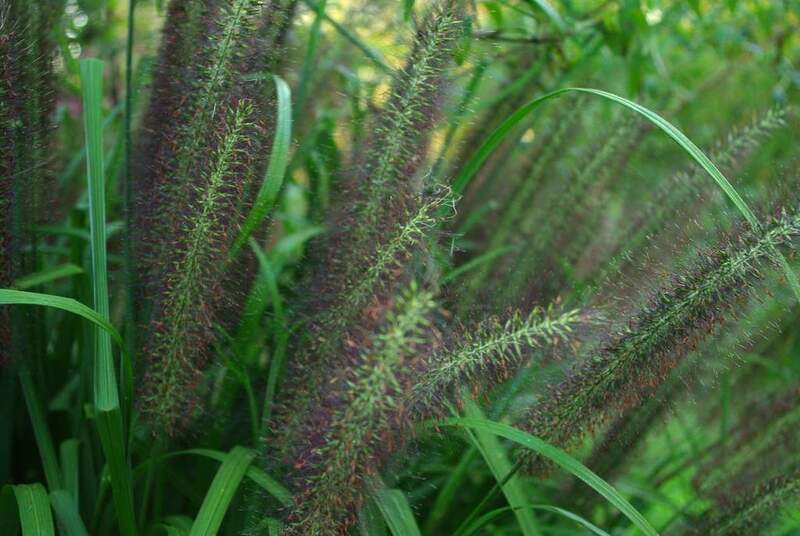 I've got a lot of grasses in my garden, so that's a lot of dancing! This past week I've posted a few times about a big bamboo removal and planting project (there's really no such thing as a small bamboo removal project). I mentioned that I would be posting a timelapse video of the entire project "someday soon". After much experimenting, "someday" is here -- today is the day! 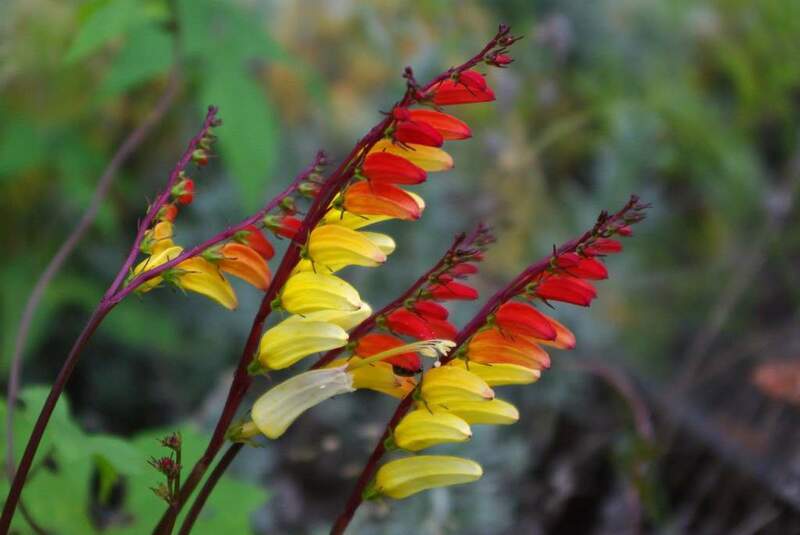 Each day for the past couple of weeks I've walked by one or two of my plantings of Spanish Flag vine (Ipomoea lobata) and thought "wow, this looks better than it did yesterday -- I should take some photos!". It just seems to keep getting better though. The flowers seem more vibrant, and there are tons of them now. When the light hits them right, you just have to stop and admire the intense blooms -- there's no walking past this one! Bamboo removal, part 3: planting! I'm finally reaching the end of this bamboo removal project. In part one I dismantled the raised bed and made divisions of the plant. In part two I removed the remaining rhizomes and the buried hardware cloth. That left me with a nice, clean pile of soil. 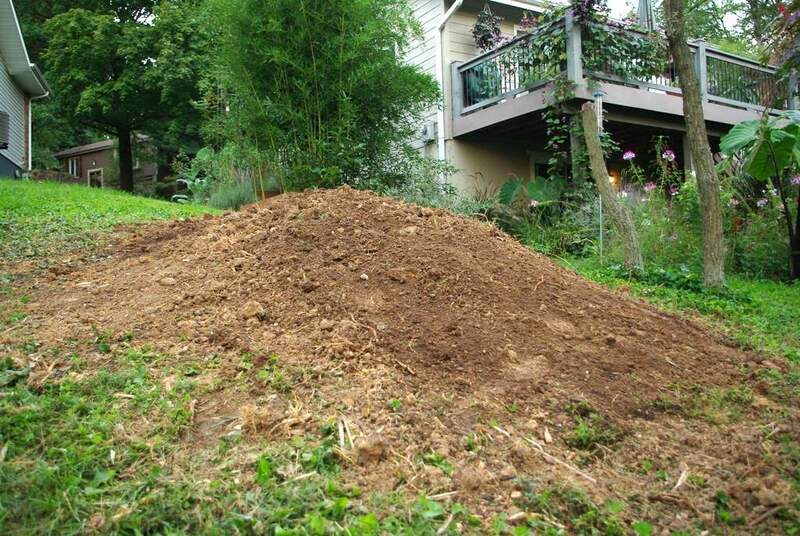 Today I'll put the new bamboo into this mound. I'm excited, so let's get started!